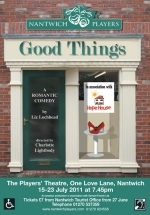 Our next production will be the romantic comedy GOOD THINGS by Liz Lochhead, with performances on 15-23 July 2011. Like the books and clothes in the charity shop where she works, Susan is a 'good thing' that nobody wants, a woman full of life, love and good humour, whose potential is going to waste. Tickets will be on sale from Nantwich Tourist Office (01270537359) from 27 June.